The easy creation of collage style images, and cost-effective badging of group members using what is essentially a readymade – the prepared sticker – has informed the identities of social groups from rock n rollers to peaceniks, conference participants to hello kitty fans. When we look at the history of the sticker in art, the story becomes even more interesting. Sticker art (also known as sticker bombing, sticker slapping, slap tagging, and sticker tagging) is a form of art in which an image or message is publicly displayed using stickers. Sticker artists use a variety of label types of stickers all of which can be customized really easily if you use online sticker printing via an easy to use app or website. The variety and speed and ease of use of these apps and sites let your mind go crazy and enables anyone to easily and cost-effectively get their message across and update it constantly no matter your budget. 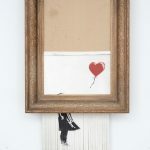 One of the biggest users of sticker art has been Banksy. 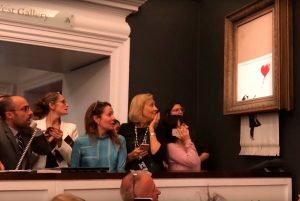 Banksy is one of the most famous England-based contemporary artists the UK has ever produced. His satirical art and subversive epigrams combine dark humour with graffiti executed in quick cost-effective ways using stencils, stickers, screen prints etc. 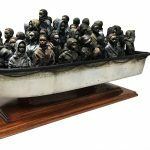 His works of political and social commentary have been featured on streets, walls, bridges and now in contemporary art galleries and museums throughout the world. Banksy started in Bristol where he collaborated with many musicians and other artists including people like Massive Attack. Another artist who uses stickers in their art is mega-artist KAWS, an American graffiti artist and designer known for his toys and paintings. Pop Art and culture permeate his cartoonish Companion series of figurines.“When your whole art is based on the lettering you choose, you kinda figure out what ones work together. I just liked the shapes of the k, a, w, s,” he explained of his moniker. Born Brian Donnelly on November 4, 1974 in Jersey City, NJ, KAWS worked in animation after graduating with a BFA from the School of Visual Arts in New York. Having started as a graffiti artist in New York in the early 1990s, KAWS began reworking advertisements in his distinctive style. Gaining both street accreditation and more recently gallery exhibitions, his work can be found in the collections at the High Museum of Art in Atlanta, the Modern Art Museum of Fort Worth, and the Rosenblum Collection in Paris. 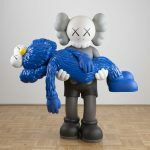 This year, KAWS worked together with Uniqlo, Kim Jones at Dior and Sesame Street characters to produce sculptures for a Dior fashion show and a Tshirt range for sale in Uniqlo. Both of these artists have made extensive use of stickers, templates and other cheap easily customisable products in their art. This entry was posted in NEWS and tagged Banksy, Kaws, Sticker art. Bookmark the permalink.